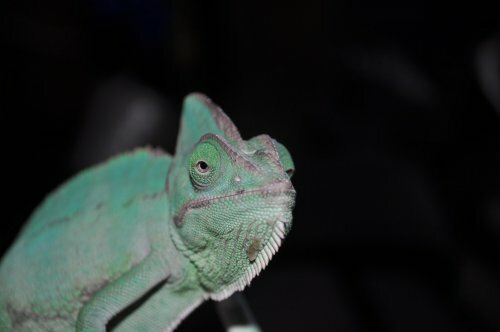 I had to go on a trip for a month an left my cham with my little brother when I returned I noticed a bump had formed on her head. I don't know if I should drain it with a sterile needle, take her to the vet, or let it be. Lighting - Zoo med uv light cant remember which exact beside the one 6a.m.-6p.m. looks like a sinus infection that formed an abscess, you will have to bring her to a vet for antibiotics before it spreads to her eyes. Have them do a culture to know exactly which antibiotic to use because you don't want to mess with these kinds of things and just throw her on any random antibiotic. I touched it with my finger and it is soft and not hard. does anybody know of good vets in Tucson? on a side note, you should also cut back her food to maybe 5 every other day to keep her from forming a clutch of eggs, also try to keep the basking temps under 83F, also if your feeders are well gutloaded you should give her the vitamins once a month instead of twice. It is a uvb cfl had it for about 5 months now with no problems. I looked at the box it is a reptisun 5.0 uvb. Good to hear! you will need to update it in less then 3-4 more months...that's the most time I would even wait and only if I was broke. I am curious as to know what would cause a sinus infection? a respiratory infection brought on by too high or too much humidity. You should let the cage dry out before bringing the humidity back up so the air doesn't get too humid. so mist, let it dry mist, let it dry, like that. Veileds are arid arboreal and need good ventilation and don't need such constant high humidity levels.